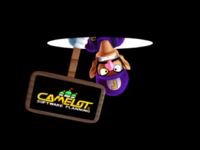 Waluigi holding up the Camelot sign for the openings of Mario Golf: Toadstool Tour and Mario Power Tennis. Camelot Co. Ltd. (株式会社キャメロット Kabushiki-gaisha Kyamerotto, DBA Camelot Software Planning) is a company that teams up with Nintendo and sometimes Sega to create games. They were originally known as Sega CD4 and Sonic! Software Planning, and were responsible for Sega's Shining series. Since the development of Shining Force III, they have renamed themselves to their current name; additionally, due to Sega's failure of the Sega Saturn, after Shining Force III, they have moved to Nintendo and have been developing Mario Tennis, Mario Golf, and Golden Sun games since. The music for these series was composed by Motoi Sakuraba, a long-time collaborator of Camelot also known for his musical work in Namco Bandai's Dark Souls and Tales series. This page was last edited on October 24, 2018, at 17:18.